يشكل فندق فندق هايدز كيرنز بموقعه الممتاز في منطقة شواطئ, سياحة, مطاعم ضمن مدينة كيرنز، مكاناً ملائماً لقضاء العطلة بعيداً عن عجقة أيام العمل. يسهل الوصول إلى هذا الفندق ذو 3.5 نجوم من المطار، فهو يبعد عنه مسافة 12 km فقط. إن سهولة الوصول من الفندق إلى المعالم السياحية الشهيرة الكثيرة في المدينة كمثل كايرنز, Cairns Historical Society Museum, Eggplant and Poppy هو استثنائي بحد ذاته. استمتع بالخدمات الراقية والضيافة التي لا مثيل لها بهذا الفندق في كيرنز. لضمان راحة ضيوفه، يقدم الفندق الخدمات التالية: خدمة التنظيف يوميًا, خدمة سيارات الأجرة, مكتب الاستقبال على مدار الساعة, تخزين الأمتعة, واي فاي في المناطق العامة . تعكس غرف الفندق البالغ عددها 102 المنتشرة في 2 طوابق جواً من الدفء والألفة.خدمات عصرية مثل تلفزيون بشاشة مسطحة, غرف لغير المدخنين, مكيف هواء, خدمة الإيقاظ, ساعة منبه موجودة في بعض الغرف المختارة. يقدم الفندق مجموعة رائعة من الخدمات كمثل حمام سباحة خارجي, حديقة، لجعل إقامتك تجربة لا تنسى. إن فندق هايدز كيرنز هو خيار ذكي بالنسبة للمسافرين إلى كيرنز، بما يوفره من إقامة هادئة ومرحة. لا تنطبق خدمات التنظيف على الحجوزات الترويجية. Good location, nice staff, big room. But it's too hot inside!!!! The air conditioning is useless, I try to open the window but doesn't help. 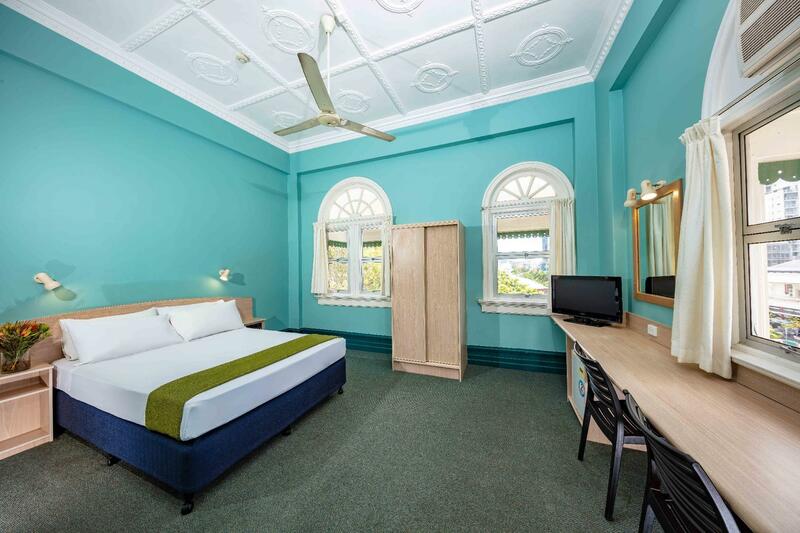 Would recommend fellow travellers to go for the ensuite rather than the heritage twin room as the former has a private toilet; modern room decoration, and fully functional aircon. The room floor is tiled and not carpeted though i had no issues with that. Staff was helpful. Location was fantastic, very near to the esplanade and night market. Many tours provide free transfers for hides hotel. Breakfast was simple but good (toast bread with diff spreads, boiled eggs and juices available). Free wifi available at the balcony. Would definitely stay there again if i have the opportunity to drop by cairns. Location in the centre of the city. 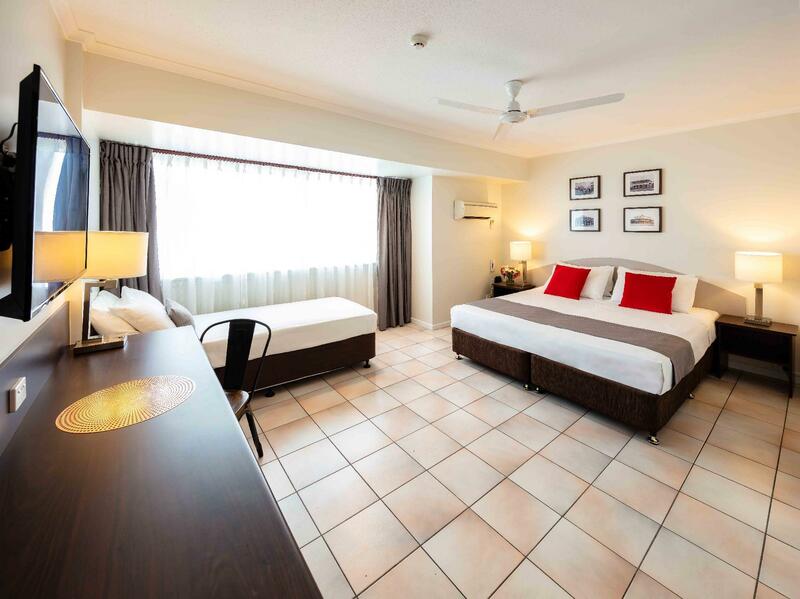 I was in Cairns for a wedding so chose to stay at Hides because of its location and because its excellent value for money. Check in was efficient, there is a lift to the floor you require, there are a large number of rooms but not much walking required to get there. I was in a room that had two beds, toilet and shower. It was clean and comfortable. I did experience some noise from girls next door but not too bad. It was walking distance to all the things I needed so was happy there and when in Cairns with or without transport I will continue to stay there. We stayed just one night here, the place has tons of charm. The patio is awesome to peoplewatch, and for breakfast, the location is superb, in the heart of town. Maybe a bit too much so, as it can get noisy in the evening. It's a lovely old building, and has kept its charm, highly recommended. Good locaition with air condition. But the internet is not for free and after check-out, cost money to leave the buggage there. About 4-6 dollars. The stuff is friendly but at midnight there are some noisy young people sreaming at the street. Reasonable price and convenient position. Staff helpful providing useful information. Good garage facility. we stayed in an en-suite room which was spacious and had been recently decorated. it was fairly simple but as the price was very cheap and the continental breakfast included i was very impressed. the reception staff were very helpful and allowed me to leave the car in the garage until 5.30pm on the day of departure. i would definitely stay there again. 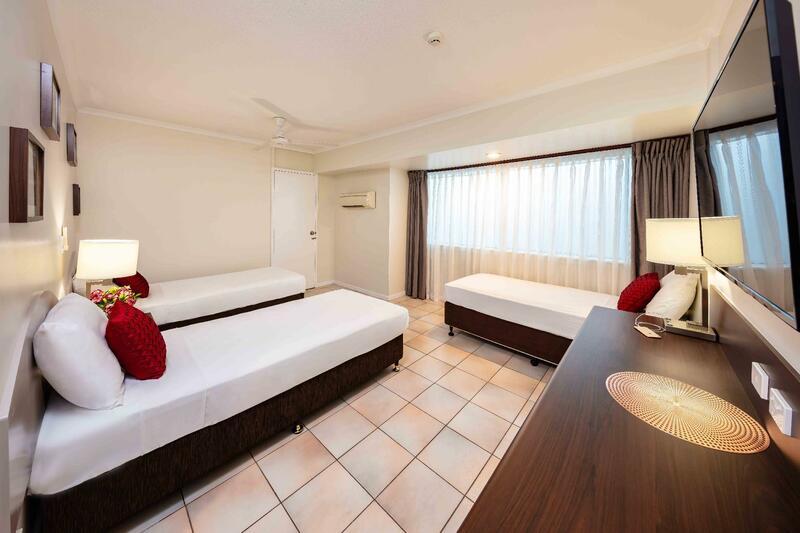 The location is exactly in CBD in Cairns city ,awesome that is close to a supermarket, and heaps shops. staff is not too bad, alright. room is kinda acceptable, BUT its very noisy every night that there is a pub downstairs till 2 or 3 am. I think it depends where your room is,but almost visitor must not be able to sleep well. At HIDES hotel, it is very well located, and all staffs here are very friendly. They include breakfast, which is light but good. The only issue is that the shower room had now hot water during my stay, however i am ok with it which some others might not be agreeing. Third stay at Hides. Previous two stays were good. Tried a Heritage room this last time (apparently an older room of the hotel), and disappointing night's sleep. Basically too close to the Shields (mall) side as I was on the balcony. Hotel (bar) cleaner below started using an air blower at 4:30am cleaning up after the night before (Sunday night of a long weekend), which was also fairly loud until late. Go a Superior room further inside the hotel. Much quieter. Breakfast as usual, can't complain. Location very central. Staff good. WiFi poor in rooms. the location is good with nice breakfast. but the room seems like no one stay inside for very long time, I keep on coughing because the room was so dusty and the bed sheet as well. Staff are nice and friendly. 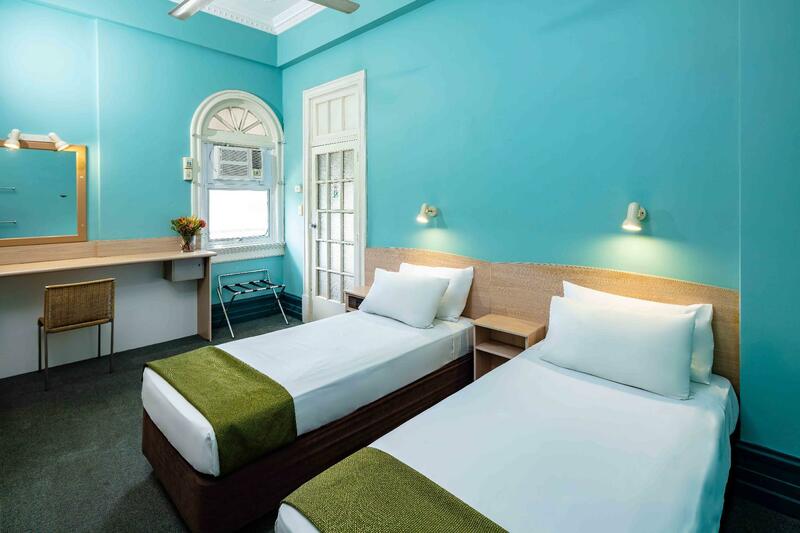 I just stayed for a few nights as a layover before and after a scuba diving live aboard trip, and I found the Hides Hotel to be a clean and decent hotel with a good location. There are two general types of rooms at the Hides - those for backpackers and those for a more conventional hotel experience. I chose the latter and was satisfied with the experience. I stayed in a "Heritage" room which was clean, bright and quiet. The free breakfast every morning was pretty much just cereal and toast, but it was enough to start the day. The staff was very polite and helpful in giving me directions around the city. The location of the hotel is it's biggest asset. It's a 10 minute walk to the Esplanade, right next to a pedestrian mall and across the street from a Woolworth's(Australian grocery store). There is a bus stop and taxi stand a few steps from the front entrance. 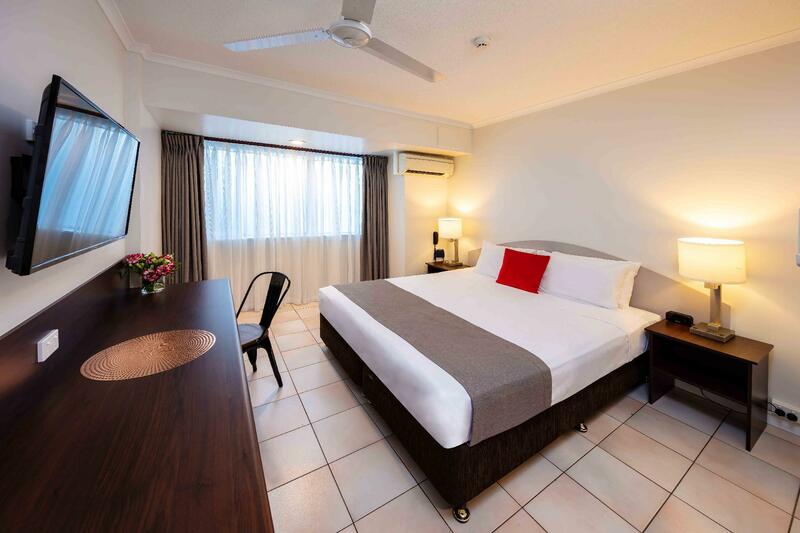 The Hides is one of the oldest hotels in Cairns and all the locals know where it is. The cons of staying here? The biggest for me is that there is no WiFi service in the room. You have to buy an access code from the front desk($6.95 Aus for 120 mins) and sit in either the front lobby or the upstairs veranda. It was pretty inconvenient at times, and I don't see why the management can't put a router closer to the rooms. Our friends recommended this hotel due to accessibility and value for money. The place, though old, is a good option to contrast all the new or high end options around the area. If you're a traveler that would like to have a decent place to sleep or stay after a day's hectic schedule, then this is a good place for you. Maybe not a good place if you're travelling with kids. There's no recreational area within the hotel, but few meters away is a playground that kids would love. If you're a traveler requiring all the fancy features of a hotel, then look for other options around the area. I have stayed at Hides before and have always enjoyed it. The staff are very helpful and friendly, always ready for a chat. Breakfast is included which is a nice touch and the price was better than excellent, it was too good to be true. Rooms are well appointed and heritage room also had access to the balcony which was delightful when having breakfast in the morning. Not too much noise although there was some construction work going on, but nothing to worry about. Access to cafes, restaurants, shops is also excellent as Hides is situated right in the heart of Cairns. Taxi fare from the airport is about AUD$20, not too bad at all. The hotel also has plenty to offer the tourist in the way of day trips or overnight trips etcetera. Overall a very good place to stay. The room was ok for our purpose, although the air con leaked all over the floor and was a slip hazard on tiled flooring. The staff that greeted me in the afternoon were so helpful and eager to please, well mannered and explained everything to us perfectly. The GRUMPY person in morning, not so inviting! had no interest in me telling him about the air con in room 126. The table cloths on the balcony could have done with being changed. We liked that the car had a safe and secure spot for the evening. We had a wonderful stay at Hides Hotel! Staff was great, bed was comfortable, bathroom was clean, free breakfast was filling. The location is amazing as well! Right next to an airport shuttle pickup, across the street from a grocery store, great and diverse restaurants all around, a short walk to the Esplanade and Marina. I would definitely stay here again! Location, Good room size, good simple FREE breakfast. Had a good stay. PJ's pub noise wasn't too bad but was expected. This time I discovered the Heritage en-suites, which are quite economical, and cheaper than the "newer" section of the hotel, although not as nice, but fine if your just travelling for work and want to save some TA. Trick though, Heritage en-suites were only available on the Agoda phone app, not on the regular website, weird!